At Risk for DDoS Outages? If You Answer Yes to the First Five Questions – WATCH OUT! We’ve all seen executives boast after a high profile cyberattack outage that they have done all that they can do when it comes to preventing DDoS attacks or other type of cyberattack outage. They suggest that these DDoS attacks are inevitable and outages, ergo, are inevitable. However, is this true? Or are there flaws in the corporate structure of these organizations that make it harder for them to combat cyber-attack, such as a lack of qualified security-specific resources in personnel or equipment. The truth is that not all companies are created equal in their risk for outages from cyberattacks. The truth is not all companies are rendered unserviceable from a cyberattack. We often hear about the problems companies face when they are hit, but there many are unsung heroes who have cleverly crafted environments which are both resilient to cyberattacks and have a strong ability to be resilient when they come under attack. How can you evaluate your exposure to risk? Please feel free to contact me with additional questions you believe need to be included on this list as I will be routinely updating these and would love your input! 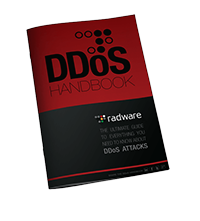 Download Radware's DDoS Handbook to get expert advice, actionable tools and tips to help detect and stop DDoS attacks.